As the first segment of The High Line opened to the public on Monday, the first public art commission to occupy the space was unveiled. The installation is based on a single day Finch spent in a boat floating up- and downriver propelled only by the natural flow of the Hudson. A camera, on a timer, took a photograph of the water once a minute for 11 hours and 40 minutes. 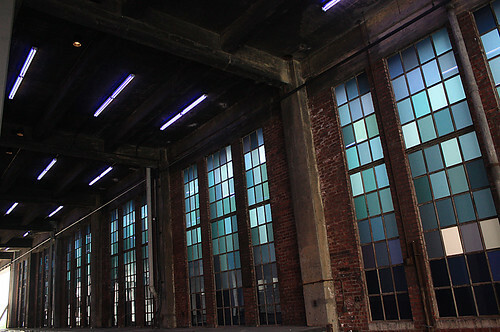 Later, selecting the exact color of a single point in each photograph, Finch produced a film with which he laminated the windows and organized in chronological order. The River That Flows Both Ways is a subtle work, unassuming at first glance, especially with construction still taking place around it. On its first day open, passersby were observed walking halfway through the underpass, apparently unaware of the exhibit, and suddenly stopped to look at the playfulness and soothing colors of Finch’s work. The park currently plans on presenting at least one other major public art project, scheduled for next spring. The artist and the project will be announced in the next few months. Pasternak explained that in addition, “Friends of the High Line will be launching an artist residency program this fall through which artists will be invited to create new work that interprets the site’s past, present, and future.” The new curator for this program is Lauren Ross. Adrian Benepe, the Parks & Recreation Commissioner, also shared his view of the park’s future. 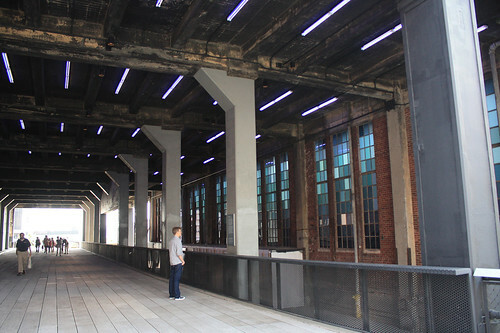 “The High Line will be one of the city’s best outdoor art museums,” he said. With Finch’s work now on view, the elevated park has a great start.